Seretse and Ruth defied family, apartheid and empire - their love triumphed over every obstacle flung in their path and in so doing they transformed their nation and inspired the world. Following the huge sucess of their films, Mandela: Long Walk to Freedom, Selma and Suffragette, Pathe UK have just released the trailer for their upcoming feature - A UNITED KINGDOM. 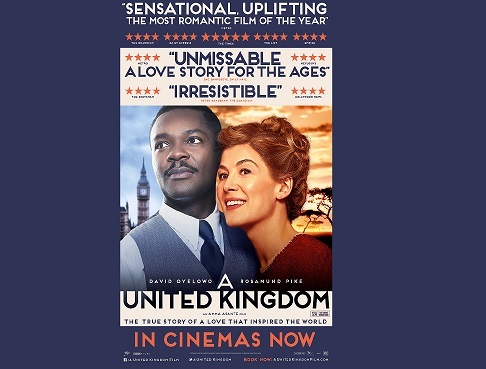 Starring David Oyelowo (Selma) and Rosamund Pike (Gone Girl); and directed by Amma Asante (Belle), A UNITED KINGDOM tells the inspiring true story of Seretse Khama, the king of Bechuanaland (modern Botswana), and Ruth Williams, the London office worker that he married in 1948 in the face of fierce opposition from their families and the British and South African governments. Seretse and Ruth defied family, apartheid and empire - their love triumphed over every obstacle flung in their path and in so doing they transformed their nation and inspired the world. The film will be released in Cinemas Nationwide 25th November and you can watch the brilliant preview below.